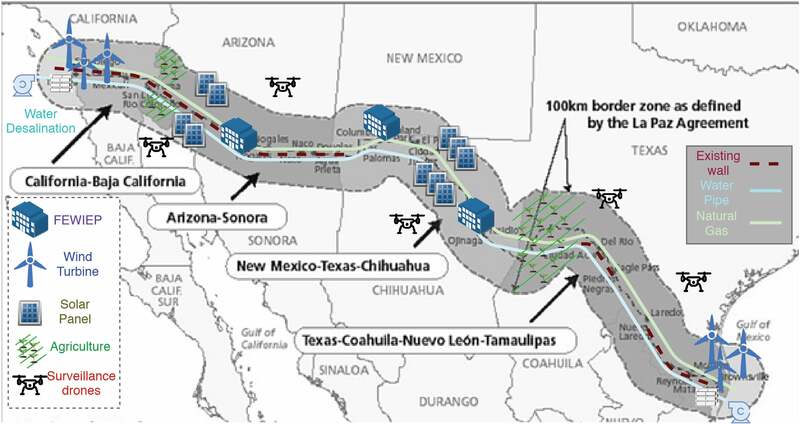 Here’s an idea: Instead of an endless, inert wall along the U.S.–Mexico border, line the boundary with 2,000 miles of natural gas, solar and wind power plants. Use some of the energy to desalinate water from the Gulf of Mexico and the Pacific Ocean and ship it through pipelines to thirsty towns, businesses and new farms along the entire border zone. Hire hundreds of thousands of people from both countries to build and run it all. Companies would make money and provide security to safeguard their assets. A contentious, costly no-man’s-land would be transformed into a corridor of opportunity. Crazy? Maybe—or maybe not. History is full of ideas that initially sounded wacky yet ended up changing society. If you’re getting a mental picture but still shaking your skeptical head, as I was initially, consider the larger situation Castillo and his colleagues have outlined in a brief white paper sent to Scientific American. The border region receives boundless solar energy, and has significant natural gas and wind resources. It’s also suffering from extreme drought, and water shortages are predicted to get worse. Farming is exceedingly difficult. And jobs are often scarce—in part because of lack of water and power. If an energy and water corridor were built, the facility owners would protect their properties. Transmission, gas and water lines would be monitored by companies, states and federal agencies, as many elsewhere are now. And the plants could be integrated with security walls or fences. With water and power, farming and manufacturing could flourish. That means jobs on both sides of the border. Many people from Mexico and farther south are trying to enter the U.S. precisely because there is no opportunity for them at home. The “future energy, water, industry and education park,” as the white paper calls it, “will create massive opportunities for employment and prosperity.” Imagine the number of jobs created, Castillo says, just for the part of the plan that calls for installing eight million solar panels. Castillo turns these negatives to positives—the philosophy behind the whole plan, really. Migrants could be workers. There are models for cooperation between governments: The U.S. and Canada have built and continue to protect important national infrastructure along their borders. For example, hydroelectric plants produce power on both sides of Niagara Falls. The U.S. and Mexico would be co-investors in the border industrial park, and would work together to guard it. Desalination of seawater, a linchpin for the park, is expensive and can also foul the ocean. An enormous amount of saltwater would have to be freshened to fill a 2,000-mile pipeline. The consortium says power could come from wind and solar, strong at the Gulf and Pacific ends of the park. A 600-megawatt power plant (equivalent to a sizeable coal plant or modest nuclear plant) at the Gulf could power enough desalination to provide 2.3 million acre-feet of freshwater annually, which Castillo says is enough to supply future needs along the Texas–Mexico border. Solar farms would power water pumps for the pipeline. “We would need innovation to really bring down the energy demand and cost of desalination,” he acknowledges. “And we would have to find creative solutions for using the salty brine” that is a by-product. Recent studies show that if the brine is simply dumped back into the sea, it can ruin coastal waters there. Yet on Tuesday the Massachusetts Institute of Technology announced a new process to convert that brine into useful chemicals. One of the first steps would be to start a series of institutes along the corridor to bolster innovation and create workforce education. They would probably be run as partnerships among academia, industry and government. The proposal the consortium sent to the four legislators asks for $1.1 billion to get these and other actions up and running. Other types of experts would have to get involved. “We will need economists,” Castillo says. “We will need people with experience in manufacturing. We’ll need policy experts who know how energy and water can be traded.” Thankfully, he adds, some of the challenges have been addressed in other parts of the country and world. The U.S. and Canada, for example, have traded gobs of power across their border for decades.